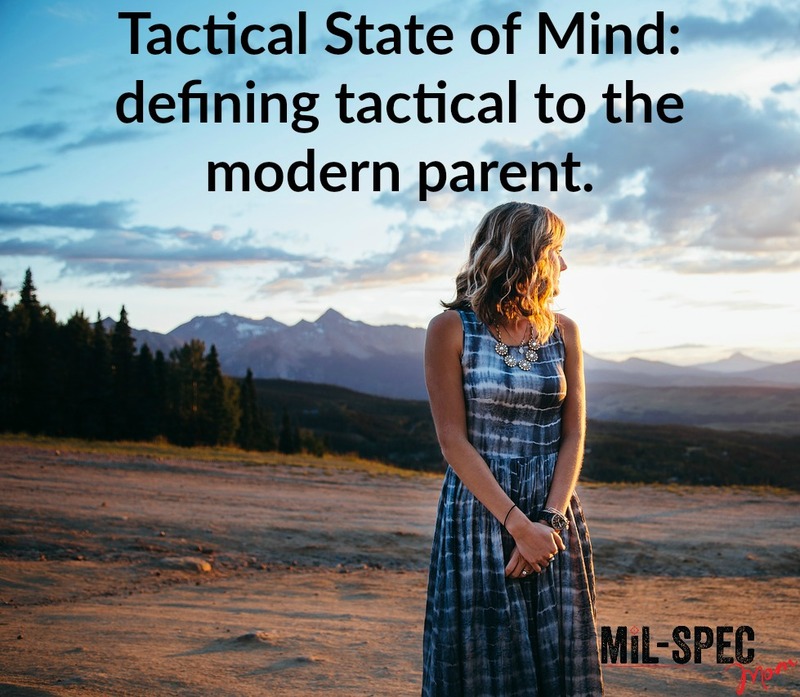 Tactical State of mind | defining tactical to the modern parent. Tactical. It can be a daunting word. For those who aren’t in the gun industry, it can be a confusing word. When you hear the word “tactical”, military guys moving around a dessert under the cover of darkness is probably running through your head. Although it can mean that, it’s not what my point is here today. My point is that parents can be tactical without ever having to pick up a firearm. It’s all about the mindset. What many fail to understand is that tactical is a type of mindset, along with a type of training. Ideally it’s a marriage of the two! It’s a style of planning and a means to an end. It’s seeing what could happen by your action or inaction alike. Tactical: (of a person or their actions) showing adroit planning; aiming at an end beyond the immediate action. I’m going to give you the definition of adroit also because I’ve never heard this word before. I seriously sat and read this description a few times before my brain finally realized I had no idea what that word meant! Adroit: clever or skillful in using the hands or mind. Tactical doesn’t have to mean military, crazy black ninja ops. Although it can. But to me, it means having the ability and the means to protect my children. It means that I can go home to them at the end of the day. To me, tactical means that I am safe. I have a peace of mind. That I have confidence in my ability as a parent to defend my kids. That inner peace that I feel, knowing that I have the ability to protect and defend my family, is priceless. Tactical is a means to an end. Tactical ensures my survivability. It means ensuring survivability with some ease. When you get ready to go to the park with your kids you want to make sure you have everything you need. You carefully plan snacks, lunches, drinks, extra clothing, diapers, wipes, toys, sunscreen, jackets. You bring every item you need in a contingency because you might need it. This is thinking tactically. You have a contingency plan. Your mind is camped in that “just in case” scenario because, as a parent, we’ve seen what happens when we forget to pack extra diapers or snacks. Heaven forbid, we forget the snacks! Aside from the snacks however, when it comes to the other side of tactical doesn’t mean one specific brand of firearm. The firearm caliber doesn’t matter within reason. The holster doesn’t matter as long as it’s responsible. A neoprene holster isn’t responsible. Any type of pancake holster isn’t responsible for a variety of reasons. Spending a few hundred dollars on a BeDazzled conceal carry purse doesn’t matter. It’s being tactical in a way that fits your lifestyle and parenting style. You don’t need to spend hundreds on a new wardrobe. But a few minor tweaks can change your ability to conceal quite drastically. THIS is being tactically minded. It’s taking what you already do as a good parent and making it better. It’s like parenting 2.0. You see, having that tactical mindset is something most parents already do. We think of those worst-case scenarios of when our children are at the park. That makes us vigilant towards random, shady people walking around the park where our children are playing. We don’t want them to get kidnapped so we make sure they stay close, that they know to yell is someone touches them, we stay off our phones to watch them and actively engage in their play. This is all having that tactical state of mind. So next time you hear the word tactical, don’t cringe! Don’t automatically assume that being “tactical” isn’t something you’re capable of! If you’re even remotely close to a helicopter mom, I promise you’re closer to being tactical than you think. Remember, you can have a tactical mindset, and ensure the safety of your family, without ever having to pick up a gun. It just helps and adds a deeper sense of peace.